If this chalet is booked, we do have several other chalets that may be available, please inquire as to if these other chalets are available. 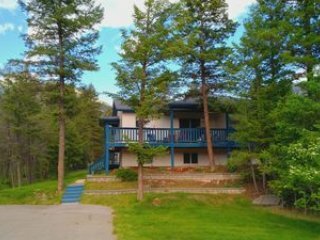 Bear Tracks Chalet is a charming and cozy 4 bedroom, 3 bathroom chalet backing onto Copper Point Golf Course's "The Ridge's" 5th tee box and the forested mountain sides of the Canadian Rocky Mountains. Bear Tracks Chalet is completely self-contained with all the amenities of home that you will require from our plush Egyptian cotton towels and bathrobes, high thread count pressed sateen cotton sheets, additional cozy throws for wrapping yourself up on the couch during that movie, exclusive Cobblestone Creek signature spa bath products and our own Craft Roasted and ground coffee, an assortment of teas and hot chocolate, sugar, salt, pepper, tin foil, stretch wrap, dish washing soap, hand soaps, household cleaners, paper products including plush toilet paper, kleenex facial tissue, a stocked kitchen including dishes, cups and utensils, bake and serve ware, waffle, coffee brewer, grill, popcorn popper, blender, hand mixer, kettle and most importantly, privacy and views that will keep you in awe, coming back year after year! Aside from the unlimited activities that are available out your door, your family's or groups stay at Bear Tracks Chalet is sure to be an enjoyable memory filled few days. Activites from hiking/walking, bird and wildlife watching, boating, kayaking or fishing on Lake Windermere or a day at James Chabot or Kinsmen Beach, only 5 minutes away, golfing on over a dozen championship Rocky Mountain golf courses, cross country skiing, snowshoeing, skiing, heliskiing, snowboarding to snowmobiling or ATV riding in the back country are all yours to discover. We also have our "Stay Golf and Soak" packages available which we can customize to the size of your group. Please inquire about pricing.